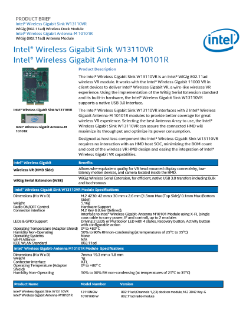 The Intel® Wireless Gigabit Sink W13110VR is an Intel® WiGig 802.11ad wireless VR module. It works with the Intel® Wireless Gigabit 11000 VR in client devices to deliver Intel® Wireless Gigabit VR, a wire-like wireless VR experience. Using the implementation of the WiGig Serial Extension standard and its built-in hardware, the Intel® Wireless Gigabit Sink W13110VR supports a native USB 3.0 ...interface. Deliver captivating commercial performance on the Intel® NUC-powered Seneca HDN* digital media player.